Flying Smurf has never given up on his dreams of being the first Smurf in the sky, and this time he's enlisted the help of Handy Smurf to make that dream a reality! 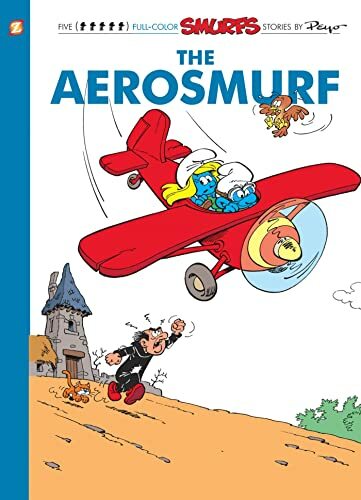 Unfortunately for everyone else, Flying Smurf and his new flying machine prove to be a disastrous combination, especially to Smurfette's garden. When she steals away for a few moments of peace and quiet, Gargamel snatches her away and sends a ransom note to The Smurfs village. With the whole village in despair, it's up to Flying Smurf to set everything right . . . but Gargamel's evil scheme is only just beginning. It looks like this rescue mission will be one Smurf of a bumpy ride! Peyo created The Smurfs in his comic strip "Johan and Peewit." Peyo wrote and drew several extremely popular comic series in Europe throughout his storied career. In 2008 the country of Belgium celebrated the 50th Anniversary of The Smurfs by issuing a 5 Euro coin featuring his beloved creation.